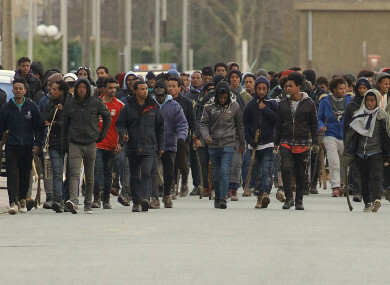 Migrants carrying sticks march in the streets of Calais, northern France, yesterday. FOUR MIGRANTS WERE in a critical condition after being shot and more than a dozen others were injured, some seriously, during clashes in the northern French port of Calais between Afghans and Africans, local authorities said. Some 22 people were hospitalised yesterday, according to an official total, including four Eritreans aged between 16 and 18 who needed surgery, local prosecutors said. Another wounded migrant was taken to the nearby city of Lille because of his “very serious state of health”, the local prefect’s office said. “We have reached an escalation of violence that has become unbearable for both those from Calais and migrants,” said Interior Minister Gerard Collomb during a visit to one of the sites of the clashes. A second fight then broke out at an industrial site around five kilometres (three miles away), with more than a hundred Eritreans armed with iron rods and sticks fighting about 20 Afghans, prosecutors said. Further violence broke out late afternoon in an industrial area of Calais, not far from the site of the old Jungle camp. It was the worst violence in Calais since clashes on 1 July, 2017 left 16 people wounded. A year earlier in June, 40 people were injured in clashes in the northern port town which draws migrants trying to sneak across the Channel into Britain. The notorious Jungle camp in Calais, once home to some 10,000 people hoping to make it to Britain, was demolished in 2016, but hundreds of migrants remain in the port city seeking to stow away on England-bound trucks. A judicial source equated yesterday’ unrest with that 2015, when the camp was created. Those left in the area, most of them young Africans and Afghan men, have been living rough in the woods and clash regularly with police, who clear their encampments and stop them from setting up roadblocks in a bid to slow passing trucks. Grim living conditions have led to regular confrontations between migrants of different nationalities, and five people were shot in a fight between rival Afghan groups last November. Charities working with migrants in the area say around 800 are currently living in Calais, while local authorities put the numbers at 550 to 600. Last month President Emmanuel Macron vowed zero tolerance for camps like the “Jungle” and secured a new border security deal which will see Britain pay more to stop migrants trying to reach its shores. But his tougher line has earned criticism from some of his allies, with his former senior aide Jean Pisani-Ferry among those signing a hard-hitting open letter claiming Macron risked betraying his image as a humanist. Email “4 people in critical condition after being shot during clashes between migrants in Calais ”. Feedback on “4 people in critical condition after being shot during clashes between migrants in Calais ”.